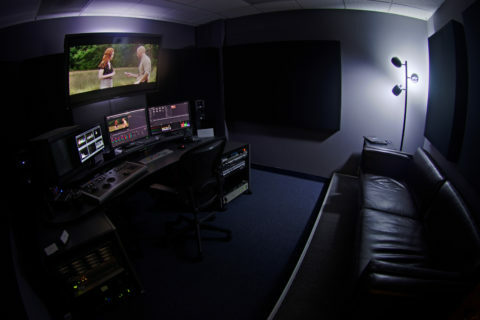 The Garrison offers rentals of our two finishing rooms, furnished with everything you need for editing, color grading and audio mixing your project. Both rooms are equipped with Mac and PC platforms and run Resolve Studio, Avid Symphony, Premiere and Scratch. Additional software is available – consult us for pricing. Each room is also appointed with the JL Cooper Eclipse color grading control surface and an external waveform monitor. Rentals include use of the reception area for clients, as well as coffee, snacks and assistance with additional office needs. 1TB of reserved space on our Nexis server is also included. $100/hr (5 hour minimum) - 58 inch Panasonic professional plasma - Couch that seats up to three clients, with enough space to fit an additional two chairs. In addition to the editing and finishing software listed above, this bay is furnished with ProTools HD for audio mixing projects. $200/hr (5 hour minimum) - Barco 2K digital projector - 10 ft. screen - Seating for up to 8 people. Also available for screenings at a rate of $125/hr. Rates apply to normal office hours from 9AM until 7PM. Additional fees may apply to rentals outside of office hours. Weekly rates are available. Please contact us with any inquiries.